Ever so often you have one of those moments where you know that you should have known something and been using it daily, because it would have shaved seconds off of your time to perform a certain task. I believe this one even constitutes creating a new category just for this sort of thing. 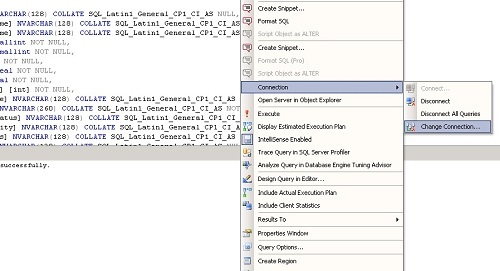 I found myself playing with a Solution someone had put together in SSMS that had Connections and Queries but I needed to change the connection. That lead me to this wonderful technet article that should have already been something I’ve used. This means that this whole time that I’ve had a query open in a window, I could have just right-clicked and hit the Connection –> Change Connection option. I did find one negative aspect to this pretty quickly because the new connection will not show up in your object explorer window and I’m used to looking at that so that I know where I have been touching things. If you are careful you could end up forgetting which server you are connected to when you run that query. SSMS Tools Pack 2.0 is out! I know I’m a little late on mentioning that this great resource has been updated. Hopefully I can do a series on “tools in your SQL Toolbox” someday, but for now I’m just letting you know that there’s an update and it’s pretty cool. Two of the biggest new features are Tab Sessions and Execution Plan Analyzer. If you are not already using it for all of the other cool features that it has, now would be as good a time as any to go and check it out. I guess if you are only in it for the money you wouldn’t want to tell your friends about an excellent opportunity to improve, but I bet you aren’t that selfish. Why don’t you go ahead and pass on the word about a great chance to learn how to do things in SQL Server you’ve only heard others blog about. So start off on the preview page to register or get a little more info. Here’s a download of the calendar in your time zone without registering, but if you register then you’ll have your own shiny reminders and you’ll need that info to view the sessions anyway. Click the image for the CST quick glance.